This week’s minorities in cartoons entry is a double one this week: Thunder and Lightning, a pair of superheroine sisters who’re the daughters of superhero Black Lightning. Thunder (real name: Anissa Pierce) is the older of the Pierce siblings. She possesses the ability of increasing her body’s mass while keeping her size the same, thus increasing her density. This allows her to become immovable and invulnerable, as well as generate shock waves by stomping her foot. Anissa promised her father she’d wait until she finished college before taking up superheroics, which she did, becoming Thunder after graduation. As Thunder, Anissa had various superhero adventures, including joining the superhero team the Outsiders. There, she met fellow teammate Grace Choi, who becomes her close teammate and eventual lover. Anissa first appeared in “Outsiders” (volume 3) #1 in August 2003. 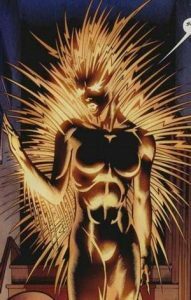 She was created by Judd Winick and Tom Raney. From “Justice Society of America” (vol. 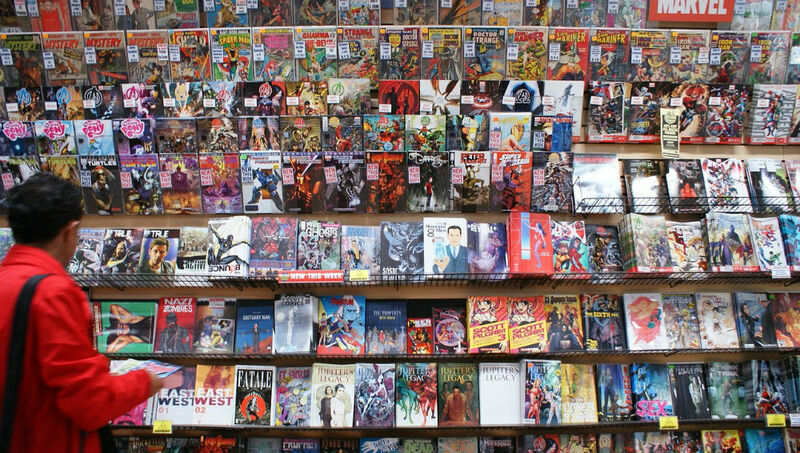 3) #12 (March 2008). Art by Dale Eaglesham. Lightning (real name: Jennifer Pierce) is the younger of the Pierce siblings. 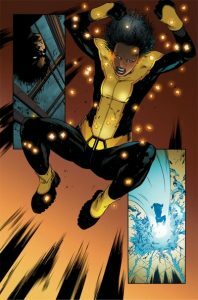 Like her father (and various other African-American superheroes), Lightning possesses the usual electrical-themed superpowers, including the ability to fly. After seeing Thunder’s more covert/less-than-mainstream superhero team (and the rough experiences she had there), Black Lightning decided his younger daughter needed a more formal training in her powers/becoming a superheroine, and had her join the Justice Society. There, Jennifer met and befriended fellow younger JSAers Stargirl, Cyclone, and Jakeem Thunder. Lightning first appeared in the Elseworlds/possible-future set story of “Kingdom Come” in 1996. She was created by Mark Waid and Alex Ross. She entered mainstream present-day continuity in “Justice Society of America” (volume 3) #12 in March 2008. For both Thunder and Lightning, the 2011 New 52 reboot saw their father Black Lightning reduced in age like everyone else (in the name of “younger and hipper”). This pretty much prevents the superheroine sisters from existing. When or if they’ll appear again is unknown as of this writing. Outside of comics, the Pierce sisters and their father appeared in a pair of “DC Nation” shorts on Cartoon Network. Cree Summer voiced Thunder; Masasa Moyo voiced Lightning; and Blair Underwood voiced Black Lightning. The shorts cast Thunder and Lightning as a teenager and a pre-teen (respectively). Black Lightning, meanwhile, seems fairly young looking. This would seem to disprove the need for the de-aging/rendered nonexistence of their New 52 counterparts.